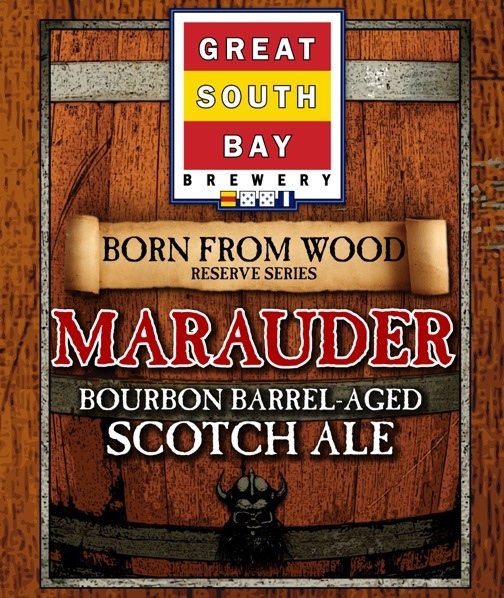 Great South Bay Brewery bottle-releases Marauder, a 10.00% ABV scotch ale aged in Tuthilltown Spirits Hudson Baby Bourbon Whiskey barrels, on March 22 (3:00PM). Marauder is Great South Bay Brewery’s second bottle production. Conscious Sedaison, a 7.25% ABV saison, was released on May 20, 2011. Limit two 16oz bottles per individual. Marauder is not your ordinary Scotch Ale. Consisting of a larger than life grain bill that starts with our base malt and roasted barley, we pack our mash tun full of an immense amount of crushed grains. Once the mash has completed, we draw off a portion of the wort and begin a kettle caramelization process turning this dark liquid into a syrup-like consistency to bring out the full, rich flavors of the malt. Once this process has been completed we add this syrup into the vat with the rest of wort and continue with an intensely long boil to further concentrate the fermentable sugars. After a lengthy fermentation process, we transfer this brew into bourbon oak barrels where we condition, age and allow it to soak up characteristics of the wood. With one taste, Marauder will snare your senses with full malt flavor, caramel sweetness and bourbon notes that are born from wood.